Hey Friends! Welcome back to the blog! We all are busy and it can be hard to make healthy choices throughout the week. To help you those choices easy for the whole family, I’m sharing with you how to make 3 salads to meal prep for a quick, grab-n-go healthy lunch! Add all ingredients to a small jar and whisk together until smooth. In a 32oz mason jar (or storage container of choice) add 3 tablespoons of dressing to the bottom of the jar. Next, layer ingredients by chickpeas, quinoa, arugula, and pine nuts. Top with a lid and store in the fridge for up to 3 days. 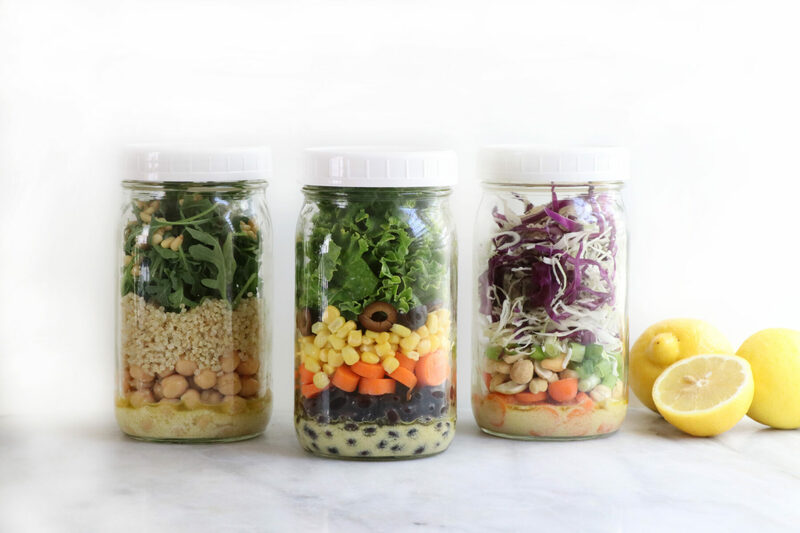 Using a 32oz mason jar (or storage container of choice), add 3 tablespoons of dressing at the bottom of the jar. Next, layer salad with black beans, carrots, corn, olives, and kale. Next, layer salad with carrots, cashews, green onion, cabbage, and sesame seeds.